The Leelanau Trail is part of TART Trails. TART is a non-profit organization that builds trails, advocates for active living and outdoor recreation. Donations to the can be made to TART here. 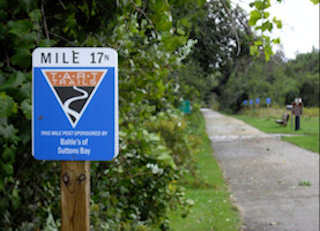 The Leelanau Trail is 15.5 miles long, is a non-motorized pathway running from Suttons Bay to Traverse City. 8.5 miles of the trails is paved and restrooms are available in the summer. The trail runs through rolling hills, orchards, woodlands and by lakes & streams. A Printable Map can be found at the TART Trails Website.